Inspired by sci-fi, BYU professor Daniel Smalley has spent more than a decade making video holography a reality. Illustration by Darren Gygi. Despite their garage being overtaken by lasers, beam splitters, and partially deflated fork-lift inner tubes (part of a contraption for balancing a table), the Smalleys of Manti, Utah, took little notice of their middle-school son’s science projects. “They were pretty oblivious throughout my childhood,” says Daniel E. Smalley, now an assistant professor of electrical engineering at BYU. What the sci-fi nut was up to back then—creating 3-D holographic images—is basically what he’s doing now, though two decades and four MIT degrees later the level of difficulty has risen significantly. Taking cues from Star Trek and Star Wars, Smalley has emerged as a leading researcher in the elusive goal of developing high-quality holographic video. Smalley first experienced holographic video as an intern at MIT’s Media Lab, where he saw a prototype for an early display. The images—though monochromatic and postcard sized—were fluidly holographic, and Smalley was mesmerized. “It became my quest from that moment on to make my own [display],” he says. He promptly declared his intention to Michael Bove, director of the lab’s object-based media group, and learned that the device cost more than $100,000 to build and required two of the largest tellurium dioxide crystals ever grown to perform its magic. While holography has been around since the 1960s, Smalley says video holography has been held back by huge costs and bitty images. His research is tackling both challenges. Like the MIT prototype, Smalley’s display uses crystals pounded with sound waves to reshape light beams into holographic patterns. But he developed a method using devices fabricated on the surface of crystal wafers—commonly found in cell phones—which reduced the cost of the light modulator by two orders of magnitude. Smalley sets the holovideo challenges he’s confronting into two categories: the holodeck and Princess Leia. The second challenge—size—is a simple matter of image resolution, says Smalley, noting that holography requires pixels as small as a wavelength of light, packing in millions or even billions of pixels for each frame. His new modulator can process enough pixels to generate fluid video as big as today’s flat-screen televisions. Trouble is, today’s consumer-grade computers can provide sufficient umph for only small images. “So now the ball is back into Moore’s Law court,” says Smalley. 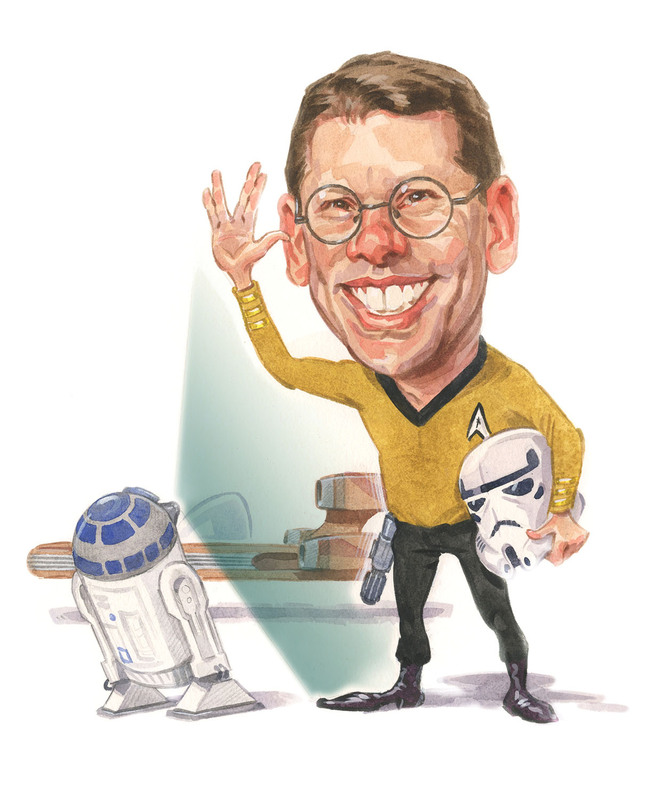 In the meantime Smalley and his students are tackling the next set of holovideo challenges, which he separates into two categories: the holodeck and Princess Leia. With a nod to the Enterprise’s virtual-reality room, where Jean-Luc can touch a holographic image, Smalley has a patent for using sound waves to create a touchable overlay for holograms. “If you felt something, . . . you would have a much stronger, convincing 3-D experience,” he says. One wonders what Smalley will do when holography becomes ubiquitous—in everything from mapping to entertainment to medicine. He has a list of 20-some other possible realms to research, but he keeps the paper face down. For now he’s sticking to the roadmap he drew up as a teen. How does the 2017 total solar eclipse stack up? Astronomy prof Mike Joner shares his most jaw-dropping moments. BYU astronomers’ patient plotting tipped off the discovery of a massive, sizzling-hot planet.